ANTI-FOG & HIGH TRANSPARENCY - The lens has anti-fog treatment on the surface of lens, is scratch resistant.When you use goggles please do not touch or wipe the inner side of lens. UV PROTECTION - UV is bad for hunman's eyes.There is ultraviolet-proof material in the lens,effectively reducing uv and protect your precious eys. SOFT SILICONE SEALS - Using soft, flexible silicone in a unique Cushion Design to form comfortable seals that won't leave goggle marks.The adjustable straps can fits for almost pepole's head size. QUICK RELEASE CLASP - Putting the goggles on and off is really easy due to the brilliant quick release clasp at the back. You'll never have to drag wet straps over your hair again. 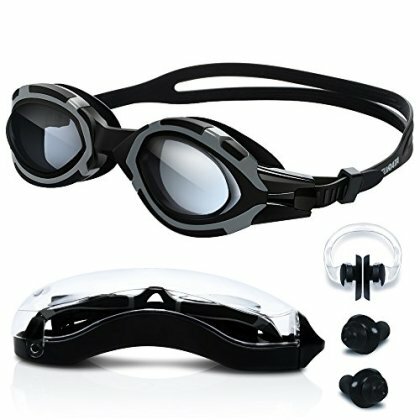 PACKAGE INCLUDE - 1 x swimming goggles,1 x goggles case,1 x nose clip,1 x ear standard plugs.